On Sunday, we looked at the Ohio State offense through the first five practices, which means it is now time to give the same treatment to the Buckeye defense. As head coach Ryan Day has said, the OSU defense returns more experience than the offense, but much of that experience is out with various injuries right now. Because of this, many younger guys are getting an opportunity to rep with the ones and twos throughout practice. Watching the Ohio State defense in the three practices we have seen, there are constant adjustments to formations and schemes, which makes definitive statements difficult to come by. Even Day didn’t want to get into scheme and assignments when he spoke with the media on Saturday. And really, it is much too early to settle on any definitives anyway. The staff is still installing the defense and is only in the beginning stages of seeing what the personnel can and can’t handle. So rather than drawing any conclusions, let’s just go over some position-by-position observations in our four-odd hours of eyeballing so far. Robert Landers has been out for most of the spring with what Ryan Day termed a day-to-day situation. “Just dealing with the shoulder, a little back, knee. He’s got a few things.” As with all of these nicks, tweaks, bumps, and bruises, there is no need to push injured players into action during the spring. The staff always sides with caution in these instances. Without Landers, fifth-year senior Davon Hamilton and sophomore Tommy Togiai have spent plenty of time with the ones. I have also seen fourth-year junior Antwuan Jackson on the field. It has looked like almost the entire defense is mixing in with the ones at times, including freshman defensive ends Noah Potter and Zach Harrison. Clearly, those two aren’t at the top of the depth chart, which means the staff is just running through as many players as they can so they can get reps and looks. 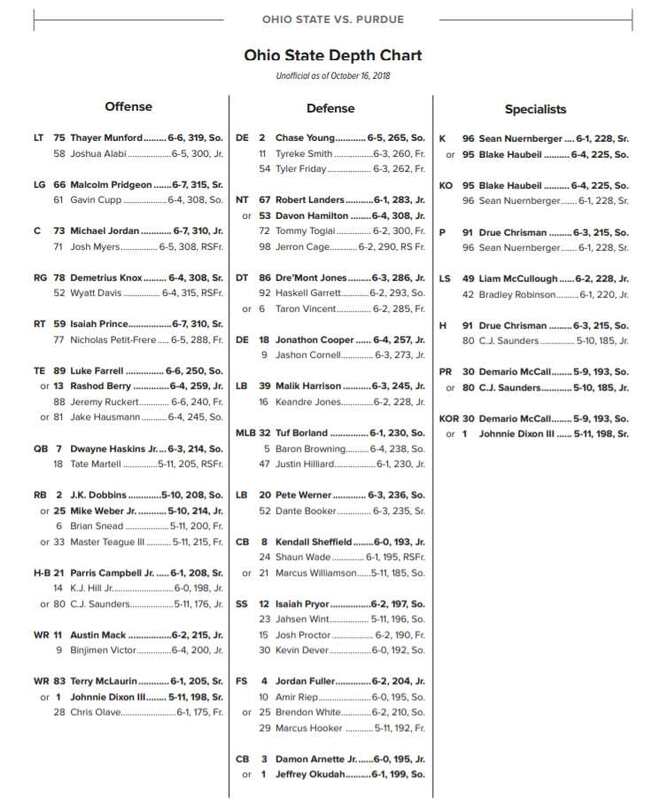 Trying to come up with a depth chart has been difficult because there has been so much rotation. It’s easy enough to know that the returning starters like Jonathon Cooper, Chase Young, and Robert Landers are still at the top of the heap. But at the three technique, you’ve had fifth-year senior Jashon Cornell, sophomore Taron Vincent, and junior Haskell Garrett all repping with the ones. To me, this looks like a wide-open battle, but all three will play. I haven’t really seen much of sophomore defensive ends Tyreke Smith and Tyler Friday, but that’s more on me than them. Tuf Borland took a helmet to the knee, so he was in a knee brace and not practicing on Saturday. Ryan Day said it’s precautionary. Sophomore Baron Browning was also out. He returned from spring break and quickly developed a hamstring issue, but it is not believed to be anything too serious. On Saturday, without Browning and Borland, it was sophomore Teradja Mitchell in the middle with the ones. He played a lot and didn’t look out of place. Behind him, for the second practice in a row, was walk-on Ben “Schmeezy” Schmiesing. Fifth-year senior Justin Hilliard suffered some type of leg injury that forced him to get into a cart and leave the field on Saturday. 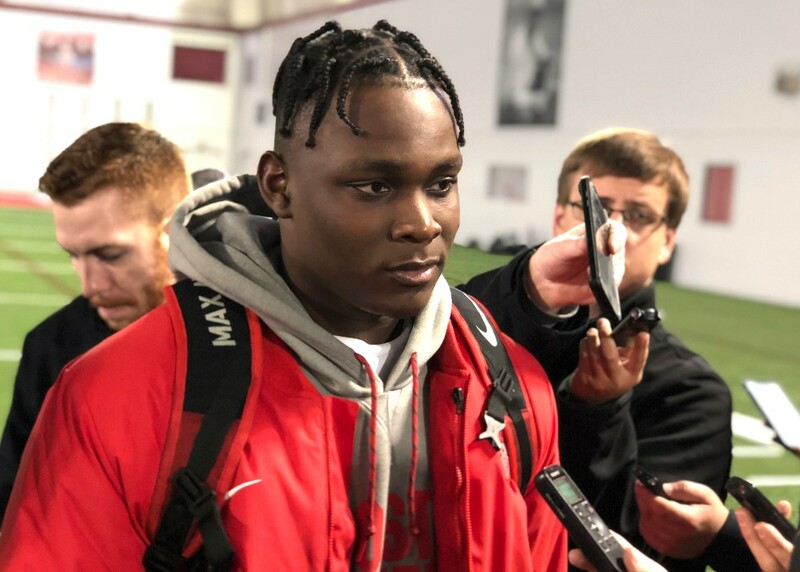 Ryan Day and linebackers coach Al Washington have both applauded Hilliard this spring for his leadership with the linebackers, so this was a blow. Hopefully it was nothing serious. Figuring out the middle linebacker situation is the easy part. Then comes the Will, Sam, and Bullett. At times on Saturday, the Buckeyes had four linebackers on the field and none of them were the Bullet. Washington said we would see that this season, so that wasn’t unexpected. Last season, the Sam played the wide (field) side of the field, while the Will — Malik Harrison — played the short (boundary) side. This year, the Will is an inside linebacker, but I’ve seen him playing on both the field and boundary. The same holds true with Pete Werner, who may be the Sam. The Sam and the Bullet will split time depending on down, distance, opponent, situation, and any other factor that may rise up. Washington had some good things to say about sophomore K’Vaughan Pope last week, remarking that he’s a contact seeker and will run a long way to find it. There may be no second-year ‘backer receiving more accolades than Dallas Gant, however. Day cited his physicality this spring when talking about young standouts so far. In terms of the Bullet, right now that’s Brendon White’s job to lose. Watching White move from Bullet to safety from one play to the next only adds to an onlooker’s confusion. And here’s where we get into some more confusion. In the past, the free safety was on the wide side and the strong safety was on the short side. We don’t know who is what right now, especially without Jordan Fuller available this spring. The top two safeties appear to be Shaun Wade and Isaiah Pryor, except for when Brendon White is also at safety. At times, there is one deep safety with the other safety up on the line of scrimmage defending the slot. Other times, there are two typical deep safeties. During the early portions of Saturday’s practice when there were six or seven different drills going on, I would be watching one group of players while constantly hearing sophomore safety Josh Proctor’s name said over the public address system because he was making plays. Wade is at nickel and safety and I was told he had three interceptions through the first three practices of spring. He brings corner coverage skills to the safety position, and the ability to make plays on the football. As he showed last year, he can also lower a shoulder. Junior Amir Riep has apparently moved back to safety after being at cornerback prior to spring break. He made a nice interception on a late pass by Matthew Baldwin on Saturday. The top two corners remain Damon Arnette and Jeff Okudah as expected. Sophomore Cameron Brown’s name was mentioned over the loud speaker a bit on Saturday as well. Sophomore Sevyn Banks and redshirt freshman Tyreke Johnson continue to rotate in throughout also. Given the new installs and new staff on defense, not thrilled to hear that Browning is hobbled, that Borland who was playing dinged up I think much of last year seems to still be dinged up, and Hilliard appears to maybe be done (taken off in a cart doesn’t sound good). And Landers having back and shoulder issues- not like those tend to just fully heal. Excited to see how Mitchell and Gant can step up. Sounds like we will need them. It sounds as if there is complexity being added that could cause some horrible confusion. I’ll applaud the changes/coaches when I see it out of the laboratory curing the disease. Me as well. And that aint saying much considering I believed the Schiano & Co. to be the worst defensive coaches ever at OSU… so though I find myself trusting this staff more, I still maintain a healthy skepticism because of how bad michigan’s defense was. It feasted on bad teams and looked awful against us.